It’s Pi Day! Today’s date, 3.14.15, rolls around only once every 100 years, making it an even more special Pi Day than usual. In fact, at exactly 9:26:53 AM, the date and time will describe pi to 10 digits (π = 3.141592653). Since it’s Caturday, you may have slept in and missed it. But don’t worry, you can still celebrate by doing geometry problems, eating pie, and reading about why Josh thinks Pi Day should fall in February. 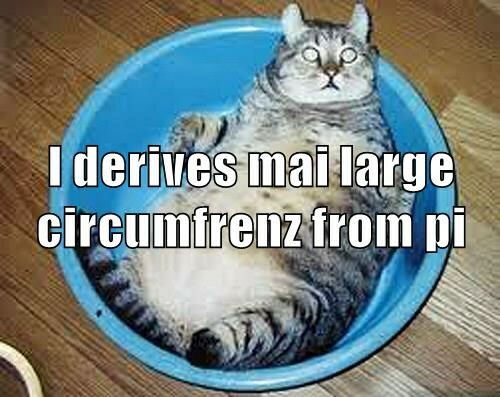 This entry was posted in Science Caturday and tagged math lolcat, pi cat, Pi lolcat, science lolcat. Bookmark the permalink.